We spent the holidays eating and climbing our way across the Yucatan. This was the first time I have ever been Mexico and I was a bite nervous about going. But as it turned out every day was a wonderful adventure. The history, the nature, the food, the towns and the people were all just wonderful. In the town of Izamal we ate food that I would gladly travel all the way back just to eat more of. 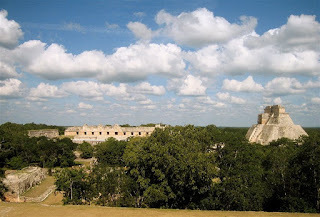 The first archaeological sites we went to was Uxmal (pictured above). It had all the classic elements of a Mayan city plus large lizards climbing all over the grounds. Some of the other sites we went to were deep in the jungle and we were the only ones there!